Luxembourg is becoming an important centre for companies involved in the exploration and future exploitation of resources harvested in space, notably from asteroids and from the Moon. However, Odysseus Space believes that there is still a great lack of information about where such useful resources are located. “No one is obviously going to send a mining expedition to an asteroid without first evaluating which one is the most profitable,” says Jordan Vannitsen, the CEO of Odysseus Space. His company therefore focuses on prospection technologies, to be used for gathering information on the best targets for resources extraction missions, and on reducing the costs of solar system probes. “Our objective is to capitalise on the latest progress made in small satellite technologies in order to reduce the cost of interplanetary missions by at least a factor 10, and to send our probes to various asteroids,” Mr Vannitsen explains. The company will start by focusing on technologies that are necessary for this long-term goal but which can also immediately be put on the market, for example for the operation of small satellite constellations. Mr Vannitsen set up Odysseus Space in Taiwan in 2016 together with two partners, Julien Hennequin, who is the company’s COO, and Marco Agnan, CTO. Asia is soon expected to become the world’s second biggest market for small satellites, and with its leading semiconductor industry, strategic location and available, underused space facilities, the company founders considered Taiwan as a good place for launching their activities. The answers to all those questions pointed to Luxembourg. The headquarters of Odysseus Space are now being transferred to Luxembourg. Mr Vannitsen and the company’s CTO will move here and expect to have the company up and running in the first quarter of 2019. “We have already opened positions for three engineers and are looking to recruit more staff in the near future. We also plan to start collaboration with the local research organisations as well as with other local space companies,” he underlines. 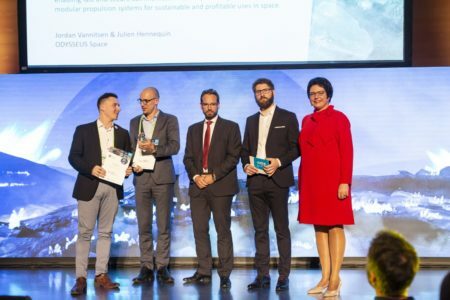 A first R&D project, implemented with the support received through the SpaceResources.lu award as well as with the company’s own financial and human resources, will focus on the development of optical communication solutions for small satellites. The plan is to follow on with additional projects aiming to reduce the technological gaps for deep space exploration missions carried out with small satellites over the coming years. The synergies will enable us to create significant value in both Europe and Asia and address a much larger market. In the middle of the next decade, Odysseus Space hopes to launch its first mission to an asteroid to demonstrate its ability to acquire useful data for space resources detection and exploitation. It will then multiply the number of space probes sent out to cover as many asteroids as possible and deliver a first version of a space resources map and with actionable data available for other companies.